A Hardening Sprint is an additional Sprint to finalize an item before it gets deployed. You can think about activities like regression testing, User Acceptance Testing, additional reviews, finalizing external interface issues. How sure are you that the “hardening” will take only one Sprint? There is a contradiction in a Sprint Zero. It is often used by companies with insufficiently informed leaders, trainers or coaches and where the ”Waterfall“ routine is predominant. This is about Sprints for Requirements Gathering, Design, Development, Test, Deployment. Scrummerfall. A team works in Sprints to tackle different phases of a project. 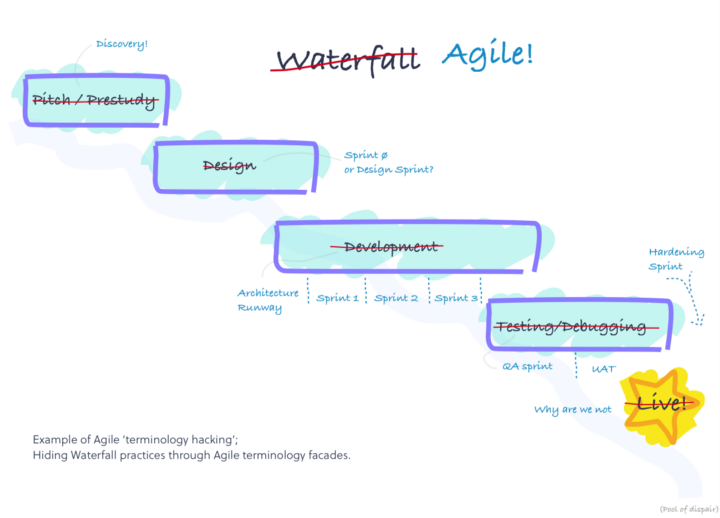 It is a Waterfall/Traditional Project Methodology initiative making use of the Scrum structure and events. Seriously, this is NOT what Scrum is about! All of the practices above include one or more Sprints that don’t deliver a potentially releasable increment. This goes against what Scrum is built upon: empiricism. Empiricism is considered to be the best way to create complex products. The product (and thus its architecture) emerges. You should have a “Done” iteration as a result of the work within the Sprint. You wish to inspect the value of the iteration and adapt if required. It is the art of taking small steps, showing what you built (transparency), inspect and adapt. A sprint may well be 80% design or architecture, as long as there is something of a working product delivered. A designer may be working on a holistic image, but should be careful with sharing it because it can create the wrong expectations. Now back to the practices described above. A Hardening Sprint is a sign that the team doesn’t have everything it needs to create a potentially releasable product. Teams that are in this situation can take the opportunity to inspect how the Definition of Done can be extended to be able to create a potentially useful version of working product. They can then take measures to adapt, like making sure that the capabilities required are also taken within the team. I wish to specifically mention the misuse of the term “Architecture Runway”. Many confuse it with “Building all the hardware that is expected to be required”, neglecting that through empiricism the product including the hardware emerges (organic growth). If you wish to focus your first Sprint(s) primarily on building up hardware, include the complete team in the work. And also deliver a working product, however small it is. Plus: remain focused on the fact that you build the hardware for the existing and upcoming features only. That is, if you wish to use Scrum’s full potential. Scrummerfall is not leaning towards BDUF. It IS BDUF. Scrum is not suitable for this way of working. Everything that can be said about Sprint Zero applies to Scrummerfall. And more. The obvious issue with this approach is that only after a number of Sprints you receive feedback on the value of the product. What if the response is negative? Months of work down the drain? No transparency results into no opportunity to inspect and therefore no opportunity to adapt. Are you working with complex products? Does this mean that you have a lot of uncertainty? Then Scrum is a great framework for you! Make sure that every Sprint you create a useable and potentially releasable product Increment. Are your products simple? Is your environment stable? Will your product hardly change in time? Are the requested increments straightforward and clearly understood by the team and all the stakeholders? Maybe Scrum is not suited for you. Or any Agile way of working for that matter. However, I highly doubt there are that many software environments with this characteristic. Thanks to Sjoerd Nijland and Roel Trienekens.